Legendary pro wrestling manager Captain Lou Albano died at age 76 this morning. According to the Miami Herald, his family says that he was at home under hospice care before his death. Wrestler's Rescue is taking up donations to help Cpt. Lou's family pay for medical expenses related to an illness that led to his death. 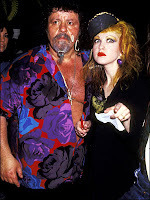 Captain Lou recently released his autobiography with a foreword by Cyndi Lauper, who used Cpt. Lou in her popular Girls Just Want To Have Fun music video that helped bring publicity to pro wrestling during the Rock 'n Wrestling era of the early 1980s as Vince McMahon took WWE national.